The Bulldog volleyball team made quick work of their county rivals Tuesday in their 2015 home opener, showing poise, efficiency, and plenty of offensive prowess in the 3-0 victory. After going back and forth with the Cavegirls in the early goings of Game One, the ‘Dogs pulled away for a 25-17 win and settled into a rhythm from there, topping the girls in blue 25-14 in both the second and third contests. “I was happy with the way the girls played,” head coach Alan Williams said today. “With it being their first home game, I think we came out a little nervous. The girls were excited, happy to have a good crowd, and I think they wanted to do really well, which put a little bit too much anxiety on us. Down 4-8 early to Carlsbad in the opening bout, Jenna Butcher delivered a trio of points from service to knot the game. The two squads would trade leads until back-to-back kills by Mattie McCombs and an ace from service by Kayla Ledezma gave Artesia a two-point cushion, 14-12. From there, three from the line by Kacey Thurman put the Bulldogs in the driver’s seat, and four straight service points – including an ace – from Butcher ended the game. Artesia bounded out to an early edge in Game Two on three points from Ledezma and took a commanding 11-3 lead on a three-point service from Butcher that included a Stacia Martinez kill and a solo block by Gracie Puentes. Aces from Alexa Riggs and Erica Reyes helped increase that lead, and two from the line by Justena Galindo saw the ‘Dogs double up on Carlsbad, 22-11. A string of side-outs and a final service point by Riggs put Artesia one away from the win, 25-14. Four points from Ledezma, punctuated by a pair of solid kills by Butcher, gave the Bulldogs a leg up in the third and final set, and three apiece by Galindo and Riggs made it 17-5. The Cavegirls were able to mount their biggest rally of the night in the waning moments, rattling off five straight points before a Butcher tip forced side-out, but the ‘Dogs needed just four points from there to seal the deal. Butcher finished with nine kills and 12 points from service on the night to lead the ‘Dogs, followed by Martinez with seven kills, McCombs with six, and Ledezma and Thurman with nine points each from the line. The win evened the ‘Dogs’ record at 2-2 following a 1-2 showing Aug. 28-29 at a tournament in El Paso, Texas. 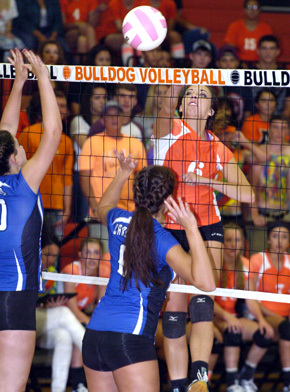 There, Artesia fell in tight matches to El Paso Chapin (1-3) and Silver (2-3) before blanking Rio Rancho (3-0). Despite the pair of losses, the Bulldogs played well for their first action of the season, with Butcher earning New Mexico Preps Player of the Week honors for her nine kills against Rio Rancho and 16 blocks versus Silver. The senior currently leads the state with 39 kills. The ‘Dogs will head to Las Cruces this weekend for the Sweet 16 tournament, and Williams says his athletes are looking forward to another test.